Thinking about whether you should get a bike for the coming energy descent? Yes, you should. Photo: jjlapierre via Flickr. So you understand peak oil. You’ve seen the movie, you get the bell-curve thing. You recognize that oil supplies can’t go on forever, and that the future prospects of cars, aviation, industrial food production and so on are looking dicey. Like climate change, peak oil presents a huge problem. The scale is breathtaking. It will turn our whole way of life upside down. 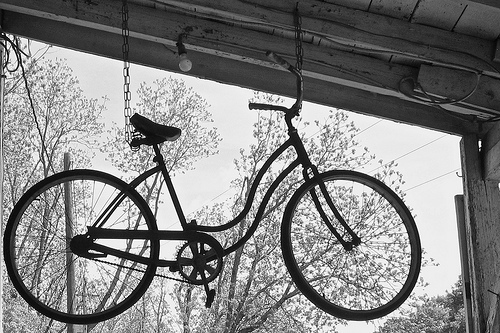 You start off wondering if you should get a bike. Then, before you know it you’re stockpiling canned goods, buying Krugerrands, and researching land prices near small towns with south-facing views and access to fresh water. It’s not surprising that peak oil prompts a run-to-the-hills response. An escalating demand for oil is basically leading our industrial way of life to the cliff’s edge. A great crash is possible, even likely, and things might get messy. But there are two ways down a cliff—you can fall, or you can rope up and carefully climb down. It’s that second option that the Transition movement aims for, rejecting individualist survivalism in favor of community resilience. The role of a Transition initiative is to guide a community safely to the other side of the coming energy crisis. It begins with raising awareness of the problems of peak oil and climate change, but emphasizes a positive response to the twin predicaments. Rather than pressing the panic button, Transition asks, Can we use this opportunity to re-imagine the way we live? How can we plan for a future with less energy? It’s a radical proposition, because everything currently gears in the opposite direction. From politicians and economists focusing solely on growth, to the government building more airports and roads, we define the good life as more, more, more. To say that the future means less of some things is pretty counter-cultural in itself. It’s even more radical to say that less might actually be a good thing. Yet it is possible to plan and work towards a way of life that uses less energy, and it is likely to be better for us in many ways. The EDAP pushes a noble and ambitious goal: analyze your town’s energy vulnerabilities, envision a future where those problems are solved, and then work out how to get there. And that’s the easy part. Next you have to persuade your neighbors to actually do it. Perhaps it’s no wonder then, that although there are more than 300 Transition initiatives around the world, the number of EDAPs can be counted on one hand. So where do you start? Even if you can draw in the expertise and ideas, how do you get the community to buy in? 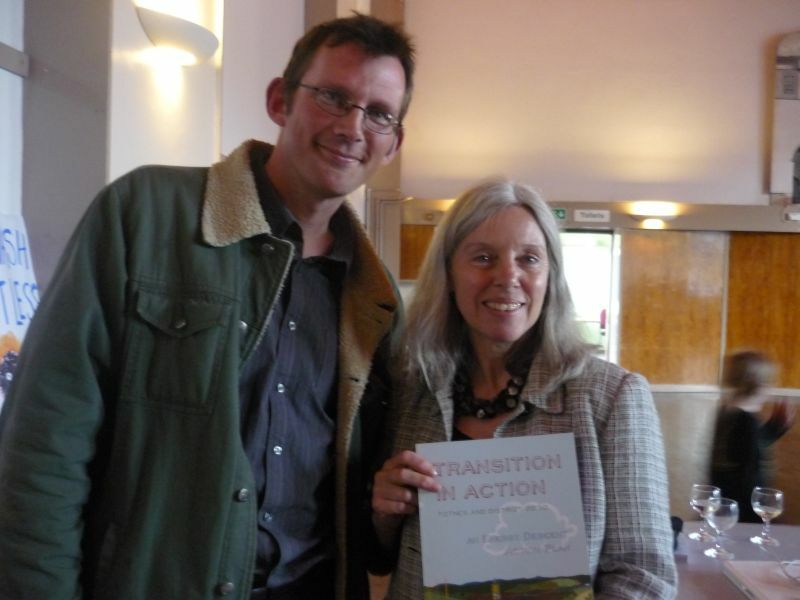 Rob Hopkins and Jacqi Hodgson premiere the Totnes energy descent plan. Photo: Transition Network. The world’s first and so far only professional EDAP compiler, Jacqi Hodgson, provided some answers. The trigger for the idea locally really goes back to the arrival of Colin Campbell in West Cork. Peak oil was first brought up in the 1950s, gaining currency in the 70s with America’s production peak and OPEC oil crises making it a visible reality. But once Alaskan and North Sea oil came online, the issue was essentially buried for two decades. It was Campbell who gave it another look, confirming the reality of peak oil as a geological phenomenon and starting to talk about it again. With the publication of The Coming Oil Crisis in 1998, and the foundation of the Association for the Study of Peak Oil and Gas (ASPO) two years later, Campbell became the godfather of the latter-day peak oil movement. Campbell began talking about peak oil to anyone who would listen. In particular, he spoke about the film that he had just helped to make, 2004’s The End of Suburbia: Oil Depletion and the Collapse of the American Dream . A local screening was organized. Inspired to think about peak oil at a local level, Hopkins, then a Permaculture teacher at Kinsale Further Education College, devised, “…a classroom project based on the question, ‘what would it look like if?’” He and his students looked at Kinsale’s energy use, food sources, healthcare provision, industry and employment, and re-imagined them in a future of energy depletion. Working backwards from a vision of a sustainable Kinsale, they were able to write a detailed timetable of change, coining the name Energy Descent Action Plan in the process. Published in 2005, the experiment created ripples well beyond Kinsale and the initial print run of 500 copies. As the first community-based attempt to plan decisively for a post-oil future, the Kinsale EDAP was the natural next stage of the peak oil conversation. Once it hit the Web, it was unstoppable. The plan was downloaded thousands of times, inspiring a host of similar ideas. Portland devised a plan, then Oakland, Berkeley and San Francisco, Hamilton in Canada, Nottingham in the UK. However, all of these were led by local government – still a top-down approach. The evolution of the energy descent plan as a community response had a little way to go. Back in Kinsale, the local Council formally adopted the plan and Kinsale became the first Transition Town. Armed with a hatful of lessons learned, Hopkins moved to England, settling in the small Devon town of Totnes. It was here that the Transition Network was founded and where Transition Towns moved the EDAP process from an academic exercise to a community project, with Totnes as a pilot. It worked, and Transition Town Totnes took off, with active groups working on food, energy, waste, housing, and local business. Each sub group fed into the overall energy descent plan process, which took four years and involved around 500 local people. Drawing it all together was a full time job, and it was Jacqi Hodgson who moved to Totnes and took the post. The Totnes plan Transition in Action: Totnes and District 2030, An Energy Descent Action Plan was published in June 2010. The EDAP includes the hinterland around Totnes, surrounding villages and farms that would have been important in medieval times. It tripled the number of people that needed to be consulted and brought into the process, but it made the plan much more workable. The result of all this community involvement is a wide sense of ownership. The EDAP “becomes about the people they know. It feels like something that’s happening in the places you’re familiar with. It feels more real. A lot of planning is very strategic, very vague, and lacking in color. What we’ve tried to do is give a very positive view of what energy descent looks like,” Hodgson says. Now that the Totnes EDAP is out, the real work begins. The next stage is to make it happen, and that’s a different challenge, especially in difficult economic circumstances. Funding is hard to come by, and voluntary organizations are short of capacity. Among those early projects are solar panels on the Civic Hall, and grants for local people to install them on their homes, too. And a new piece, Transition Together, is bringing the plan to street level with household support groups to disseminate the plan. The Totnes EDAP is not the only plan out there. The Sunshine Coast in Australia claims to be the first plan of its kind, but for its comprehensive approach, research base, historical context, and community buy-in, Totnes takes it to the next level. Is it the definitive EDAP? Probably not, because energy descent is an ongoing conversation, and unique to each area or town. But if you’re involved in planning for peak oil in your community, it’s certainly a good place to start. And having traced the story of the EDAP so far, perhaps it’s best to give Totnes’s attempt the last word. You can read it online, and it starts like this. What you are about to read is as much a story as it is a community plan. It is a story about how a Devon town and its surrounding parishes embarked on an extraordinary journey…harnessing all of its creativity and brilliance to re-imagine itself for a rapidly changing world. It is the story of ordinary people who came to see that their future would be very different from the present, and that that change was an inevitability. Rather than panic, switch off or slump into denial of the changes building around them, they took the braver, more testing, but ultimately more nourishing route, of seeing that change as a tremendous and historic opportunity. Lucky for the rest of us, the Totnes plan provides a blueprint. All it takes now is for localities to check it out, adapt it to their own needs, and get involved to make it happen. And that’s the whole point of Transition. Individual survivalism equates to individual preparations and these serve as exemplar cases for other individuals and the community as a whole. AS one of the first organic and carbon neutral farmers in the country, who power the whole farm, house, lifestyle, farm machinery and all our transport by renewable energy, I can see how our approach is empowering the many visitors that come to learn from us on our numerous open days and from my presentations to various groups. Good point – I’m suggesting the movement rejects purely individualist responses because true resilience lies in community, but there’s plenty of stuff we can do as individuals too. In fact, part of being a responsible member of a community is to make sure you’re prepared enough that you’re in a position to help if things get tough. So you’re right, there’s a balance to strike there. I think we are dealing with a semantics issue. What is commonly believed to be “individual survivalism” is really “individualized consumerism”, and is a tool used by marketers to get people to build castles (McMansions) and fill them with “necessary” items, as opposed to community living and sharing of resources. The individualism meme sells much more ‘stuff’ than the community meme. What is really at issue is whether one acts in ways that contribute to future resources (books, beans, bullets, cooperation) or in ways that waste future resources (debt, fossil fuels, automobiles, competition). Paul’s example is one of common future (building the soil, etc) where, even if he works alone, he is working for a future self. The opposite is where someone borrows money (promising to burn up resources in the future to create the money) and uses it for individual satisfaction without regard to even their own future self as a human equal to themselves. The latter is what we call “free market economics”, and it works best when everyone believes an Apocalypse is coming to wipe out all of their debts and responsibilities. It also explains why so many vote against their own best interests: they don’t give equal resource rights to their own future person. True civilization gives more rights to the future persons than to the present persons. That’s sacrifice.